A sinkhole, about 100-feet-wide and 50-feet-deep, opened up in the backyard of a home in Windermere, Fla., May 3. Almost one week later, another sinkhole that was 80-feet-long and 40-feet-wide opened in the backyard of a home in Jonesville, Fla.
A sinkhole formed feet away from a home in Windermere, Fla. on May 3. A sinkhole is a natural depression or hole in the Earth’s surface that is caused by the dissolution of carbonate rocks. According to Grenville Draper, professor in the Department of Earth and Environment, rain is not necessary for a sinkhole to form, but a period of intense rain after a drought can trigger one. Florida bedrock is made almost entirely of limestone. A sinkhole occurs when that limestone dissolves, Draper said. Sinkholes can happen worldwide. The largest are currently found in New Guinea and Venezuela in South America. They are also common in Michigan, Kentucky and Tennessee. 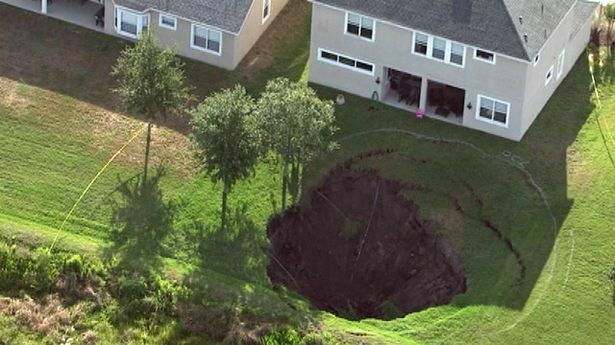 As for Florida, Draper says sinkholes are not uncommon, but occur more often in the central part of the state.